By purchasing syringes from HealthWarehouse.com, you are asserting that you are over 18 years of age and that you intend to use these syringes for the treatment of diabetes or for another legitimate medical purpose. It is legal in most of the U.S. to purchase insulin syringes without a prescription; however, you are solely responsible for following the laws in your state. HealthWarehouse.com reserves the right to refuse any order in the event that filling such order would violate any federal, state, or local law or regulation. 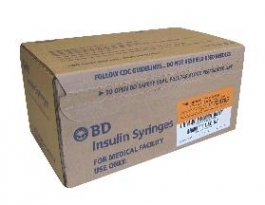 BD's classic design for injection comfort, the BD PrecisionGlide™ Needle is a 27-gauge, 12.7mm (1/2") syringe needle that has been trusted for years by people with diabetes.